Published on 25. 01. 2012 in commentary and criticism and pictorial arts. 2 Comments Tags: Leonardo da Vinci, Ludovico Sforza, Milan, National Gallery London. Leonardo had only recently arrived in Milan when in 1483 he was given the opportunity to realize in a painting the thoughts he had been formulating privately about art and life. The resultant picture was a watershed in his career, and in Western art. The commission was for an altarpiece depicting ‘Our Lady with her son and the angels’ for a newly consecrated chapel dedicated to the Immaculate Conception. At this time, Lombard tradition for altarpiece decoration was characterized by ample gilding and figures arranged declamatorily on relatively flat backgrounds. 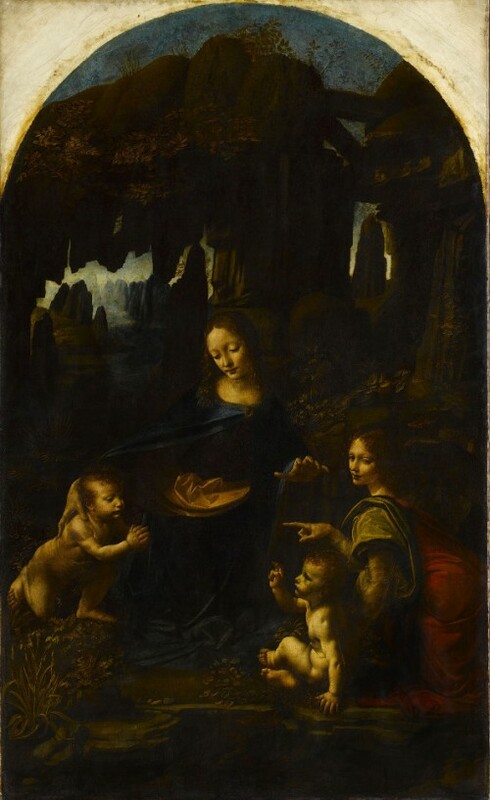 Leonardo’s so-called Virgin of the Rocks, which he finished a year and a half later, was different in kind: animated figures interacting in a richly detailed, highly naturalistic, rocky environment of great depth. Central perspective and the three-dimensional rendering of space were old discoveries; what Leonardo did here was to immerse his figures in their environment more fully than anyone had done before. The characters seem free to act not just as individuals, but in relation to each other — their body language, facial expressions and eye lines suggest complex interaction. The picture has a kind of spatial and psychological coherence that would come to inform Western art down to the modern era when cubism started dissolving rationally defined space, opening the door to abstraction. 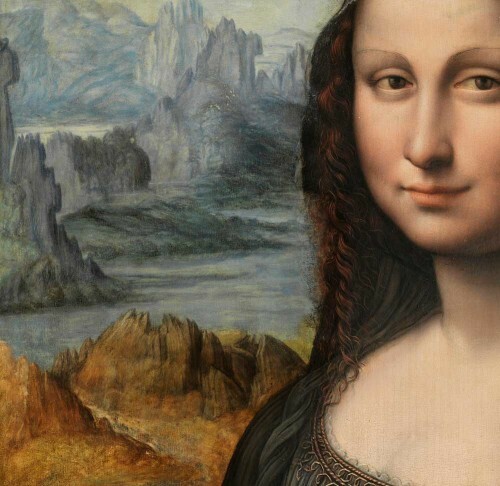 The painting, which normally hangs in the Grande Galerie at the Louvre, is currently and extraordinarily on view in the exhibition Leonardo da Vinci — Painter at the Court of Milan at the National Gallery in London. For the first time ever, it shares a room with that museum’s own, later version of the same subject. 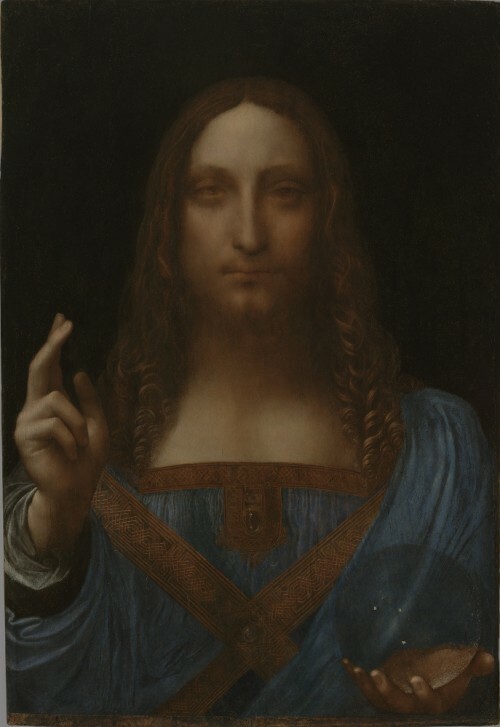 Leonardo began work on the second version about ten years later for the same patron, because the first picture had ended up being dispatched to a third party due to prolonged contractual disagreements, and he only finished it in 1508. Sadly the two pictures are placed facing each other in the central room of the exhibition, instead of being hung side by side, which would have enabled more easy comparison. Nevertheless, this is a unique opportunity to compare them and thus to form an idea of the artist’s development in the twenty-five years that separate them. After serving for an extended period in the workshop of Andrea del Verrocchio, Leonardo da Vinci (1452–1519) set himself up in Florence as an independent master around 1478, and in 1482 he was given the chance to serve at the Milanese court. Milan at this time was one of the largest and richest Italian city states, ruled by the ambitious duke Ludovico Sforza (1452–1508), who had just assumed power after his two older brothers had both perished violently. 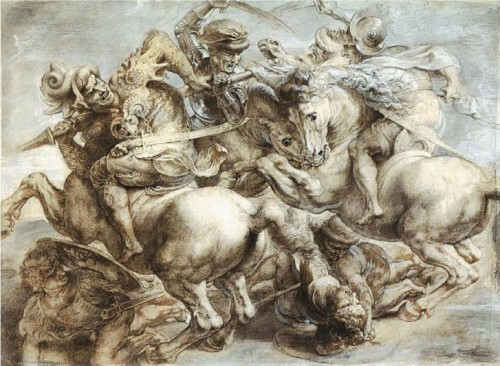 Ludovico saw in the work of the gifted Tuscan a possibility of legitimizing himself as a humanist head of state and simultaneously to profit from the artist’s ideas for the development of elaborate war machines, which Leonardo emphasized as his central asset in his famous and oft-cited letter of introduction to the duke. But it was primarily as a painter that Leonardo came to serve Ludovico, and it is his achievements in this area that are the focus of the exhibition. Presenting an impressive nine paintings fully or partially executed by the master (which amounts to about half of his modest oeuvre), as well as an exquisite selection of drawings and a number of works by his pupils and contemporaries, the exhibition not only offers the visitor valuable insight into Milanese painting under the influence of Leonardo, but also and more fundamentally into how pictures were a way for the artist of reflecting on and comprehending the world. 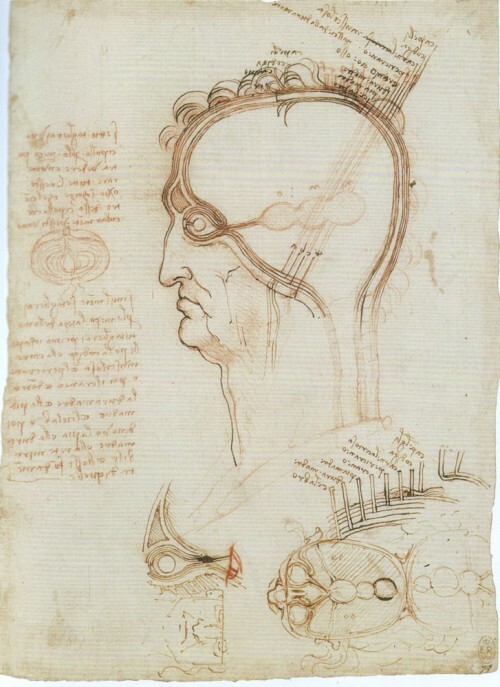 A number of the drawings exhibited demonstrate Leonardo’s mapping of human anatomy, especially the skull, as well as his studies of the human body, still and in motion. The results of these inquiries are fairly directly reflected in his portraits, notably the picture of Ludovico’s young lover Cecilia Gallerani, better known as the Lady with the Ermine (c. 1489–90), lent to the exhibition by the Cracow Museum. Leonardo elegantly swathes Cecilia in the latest Spanish fashion, enclosing her hair in a transparent veil, secured around her head by a black headband. In this way, he accentuates the underlying structure of her skull, but at the same time he flattens her jet black necklace against her white skin to achieve a linear, graphic contrast. This complex interplay of modeling in space and drawing on the surface is mirrored in the way he interfolds different layers of meaning. 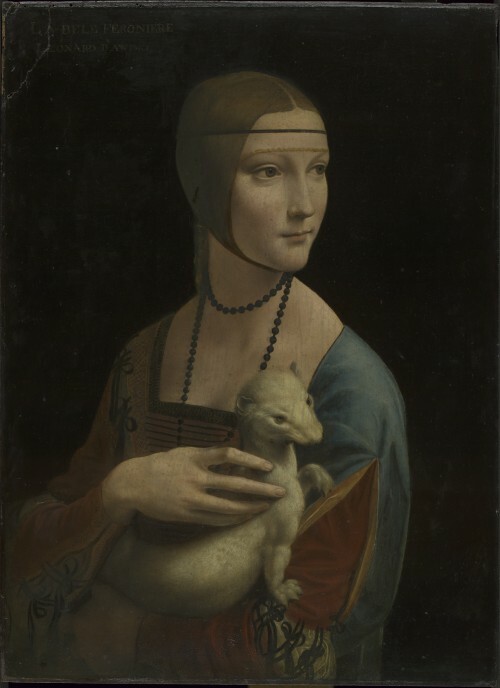 In one sense the picture inserts itself in a chivaleresque tradition, portraying the sitter as a chaste ideal (the ermine with its white winter coat was a symbol of purity), but she is simultaneously and obviously the intelligent and witty woman recorded in the written sources. The natural center of a party, as one critic has described her: beautiful, present, and confident. Leonardo captures her just as she is turning her head attentively, quite probably toward her lover. In this respect, the ermine refers to their relationship: the two first syllables of her last name form the Greek word for ‘ermine,’ while the King of Naples had bestowed upon Ludovico an order named after the same animal a few years earlier. On a more fundamental level, the roused predator (which Leonardo constructed on the basis not just of observations of the weasel family, but also dogs and bears) is a potent manifestation of the woman around which it snakes — a totem-like extension of her personality. The sitter’s smooth, elongated and slightly oversize right hand sensually caresses its fur, suggesting her nature, and perhaps that of our own species as such. The Virgin of the Rocks offers a similar statement on human nature. The commission required Leonardo to infer the Immaculate Conception, a subject burdened by centuries of theological controversy. The central issue was how it was possible for Mary to give birth to the divine Christ when she herself had been conceived in sin. In this picture, Leonardo offered his own, rather unorthodox interpretation of this paradox by situating his protagonists in a primordial landscape, based on scrupulous sketching in the river basin of the Arno Valley. The figures are depicted among — and equated with — different species of plant that are all described with the accuracy of a botanist. He thus connects the Christian mystery with pagan creation myths of man being born of the earth. To him, who sees divinity revealed in natural phenomena, Mary is immaculate because she personifies the order of Nature, and therefore God. With her she has the Christ Child, attentively blessing the young John the Baptist, who as we know will one day return the favor by bestowing the first sacrament on him in the River Jordan. By leaving out the Baptist’s conventional attribute of the cross, as well as the traditional, gilded haloes that appear in the more orthodox second version, Leonardo boldly opens the picture to wider interpretation. But he provides us with an important indicator: the angel who, seemingly aware of our presence, looks out of the picture, points toward John. Recent x-ray analysis has shown that Leonardo decided to include this feature rather late in the creative process — originally the angel’s right hand rested on its knee, as it does in the later version. This poignant gesture thus appears as a breathless instance of inspiration, inserted between the Madonna’s tenderly protective hand and the Christ Child’s, raised in blessing. It emphasizes the essential: God’s forgiveness. In its very execution, the picture’s soft definition and glowing unity of color reveals Leonardo’s conception of the world. His chiaroscuro, in which form emerges from the dark, derives from his realization that it is impossible precisely to determine where one thing ends and another begins. The world, as he writes in his notes, is “infinitely divisible.” We are nature, and nature is us, in one continuum. The contour of drawing and the brushstroke of painting, thus, are both abstractions that remove us from the real, which is why he tries to eliminate them through his famous sfumato technique, which as he writes “light and shade are blended in the manner of smoke without strokes or marks.” A picture should appear as though it had always existed, untouched by human hands. It is however essential that everything appears as if seen by human eyes. In another passage, Leonardo compares his chiaroscuro with how passersby at dusk appear to lose definition in front of our eyes. The mutability of our vision — and senses more generally — is thus a basic condition of experience, while perfect, all-sensing insight belongs only to God. One senses that this is why Leonardo is so intent at revealing the inner life of Cecilia Gallerani — the divine is manifest in individual, subjective experience. The exhibition acknowledges this insight by opening with a drawing showing a partial section of the human brain, in which the individual layers, from skin to neural tissue, are compared to those of an onion. Although certain features are accurately represented, it is a speculative effort. In partial anticipation of modern descriptions of the visual cortex of our brain, Leonardo here suggests allegorically how the eye is connected to three interdependent ventricles: one that contains the imaginative facilities, one that comprises those of the intellect, and one that fathoms memory. It is in the first — the so-called senso commune, or synthetic faculty — that our experiences are processed to provide the framework for our experience. This is where the soul is located and God’s order made manifest. And it is due to this faculty that we are capable of creating images. Leonardo’s time in Milan ended shortly after Ludovico was ousted by the French invasion of the city in 1499. 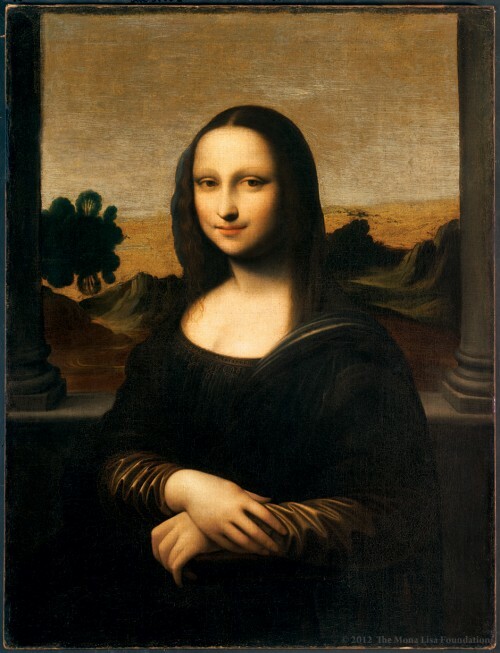 As mentioned initially he would return later, but for now he went to Florence, where he painted the ubiquitous Mona Lisa (after 1502, not exhibited), a picture that stands as a revelatory summary of his insight into man’s place in nature, and nature’s in man. Shortly before that, however, he had completed another great synthesis, The Last Supper, which he painted in the refectory of the monastery of Santa Maria delle Grazie in Milan between 1492 and 1498. The exhibition devotes a separate space upstairs to this iconic work in which inner life and outer drama are spiritually united in one of the definitive expressions of Western culture. The picture itself is represented through Giovanni Pietro Rizzoli’s faithful copy from around 1520, which elucidates details lost in the dilapidated original. Leonardo painted The Last Supper directly on the wall in a dry oil technique, which already started flaking in his own lifetime. A similar issue haunted his next, great commission, a colossal battle picture for the great assembly hall of Florence’s Palazzo della Signoria, which fell apart as Leonardo and his assistants were painting it and became a direct reason for his premature departure for Milan in 1506. Such problems also plague his surviving paintings on panel, most of which are also quite seriously affected by later wear and tear: the French Virgin of the Rocks, for example, is extensively retouched and is severely darkened behind several layers of varnish, while its English counterpart’s metallic crispness appears at least in part to be the result of overeager restoration over the years. The Portrait of Cecilia Gallerani is fairly well-preserved, but the black background of the picture is the result of later overpainting. And so on. 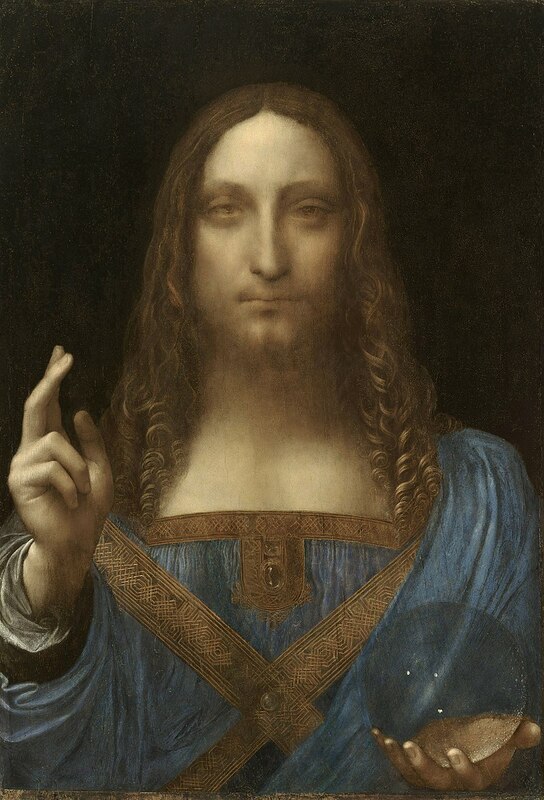 This is also evident in the spectacular new discovery of the show, a picture of Christ as Savior of the World, which follows iconographic tradition in depicting him frontally with his right hand raised in blessing, while in the left he holds a coolly transparent crystal sphere. The picture was rediscovered in an American private collection a couple of years ago and was upgraded from derivative to autograph status. There is no doubt that the design is Leonardo’s — it is documented both in writing and sketches — but its poor condition makes it hard to determine to what extent he himself was involved in its execution. It is uneven in quality, especially when compared with the masterworks that surround it in the galleries, which suggests that it is a studio picture supervised by the master, who personally took care of important details such as Christ’s beautifully painted right hand. It makes sense that Leonardo, who continuously emphasized the imperfection of human experience and went as far as to locate the divine in it, left so many pictures unfinished and unrealized. Nevertheless, his work is always expressive of an immense generosity, aesthetically as well as philosophically. It is carried by an unflinching, inspirational ambition, even in the smallest sketches. A continuing reminder of the miracle of our own experience. Originally published in Danish in Weekendavisen 18-24 November 2011. Published on 18. 11. 2011 in hype & linkage and pictorial arts. Closed Tags: Leonardo da Vinci, Weekendavisen. Portræt af Cecilia Gallerani ('Kvinden med hermelinen'), ca. 1488, olie på træ, 54,8 x 40,3 cm., deponeret på Nationalmuseet, Krakow. I denne uges Weekendavis kan man læse min anmeldelse af den forrygende Leonardo-udstilling, der netop er åbnet på National Gallery i London. Se den udstilling hvis du overhovedet kan.
Desværre har avisen ikke fundet plads til at gengive et af de billeder jeg diskuterer indgående, nemlig portrættet af Cecilia Gallerani, i fuld størrelse (det reproduceres i beskåret form i topmenuen på kultursektionens forside). Men her er det så.